Persistence Market Research (PMR) offers a 10-year forecast on the global external fixators market. The primary objective of the report is to offer updates and information related to opportunities in the global external fixators market. In terms of revenue, the global external fixators market is expected to register a CAGR of 8.5% during the forecast period of 2018–2028. The primary objective of the report is to offer insights on the market dynamics that can influence the growth of the global external fixators market over the forecast period. Insights on the key trends, drivers, restraints, value forecasts and opportunities for companies operating in the global external fixators market are presented in the report. Globally, the increasing demand for technologically advanced external fixators, for improved and accurate treatment of orthopedic disorders is expected to drive the growth of the global external fixators market over the forecast period. An orthopedic disorder is a disabling joint disorder, which is globally affecting millions of people. Globally, there are more than 8.9 million fractures annually caused by osteoporosis. Thus, the increasing population with orthopaedic disorder is expected to create a huge demand for external fixators over the forecast period. The growing geriatric population is also expected to drive the growth of the global external fixators market as people aged 60 years and above are at a high risk of developing degenerative disc disease, osteoarthritis, and low bone density. According to the World Population Prospects, 2017, the number of geriatric population (aged 60 years and above) is expected to be more than double (2.1 billion) by 2050 and to more than triple (3.1 billion) by 2100. Furthermore, rising incidence of road accidents and sports-related injuries is the other factor expected to trigger the growth of the global external fixators market over the forecast period. In athletics, traumatic injuries to the extremities are very common, where early diagnosis and initial treatment is important. According to the WHO, road traffic injuries are estimated to be the ninth leading cause of deaths globally, which is predicted to become the seventh leading cause of deaths by 2030. These are the major factors that are expected to create huge opportunities for the growth of the global external fixators market over the forecast period. To understand and evaluate opportunities in the global external fixators market, the report offers the market forecast on the basis of product type, application and end user. The report provides analysis of the global external fixators market in terms of market value (US$ Mn). The report begins with the market definition, followed by definitions of the different external fixators types. The market dynamics section includes PMR’s analysis on key trends, drivers, restraints, opportunities and macro-economic factors influencing the growth of the global external fixators market. Opportunity analysis provided in the section allows clients to better equip with crystal clear decision-making insights. The next section provides competitive edge of the global external fixators market. This section is primarily designed to provide clients with an objective and detailed comparative assessment of the key providers specific to a market segment in the external fixators market. The competition landscape section provides a dashboard view of the activities of major players in the global external fixators market. The company profiles section provides information on the key offerings of each player in the global external fixators market, their direct & indirect presence, revenue, key developments and strategies and SWOT analysis. The key players included in this report are Johnson & Johnson Services, Inc. (DePuy Synthes Inc.), Stryker Corporation, Zimmer Biomet Holdings, Inc., Smith & Nephew plc, Orthofix International N.V., Ortho-SUV Ltd., Response Ortho LLC, and Tasar?mmed T?bbi Mamüller San. Tic. Ltd. ?ti, among others. In addition, we have considered Year-on-Year (Y-o-Y) growth to understand the predictability of the market and identify growth opportunities for companies operating in the global external fixators market. Another key feature of this report is the analysis of the key segments in terms of absolute dollar opportunity. This is usually overlooked while forecasting the market. However, absolute dollar opportunity is critical for assessing the level of opportunity that a provider can look to achieve, as well as to identify potential resources from a sales and delivery perspective for services offered by the external fixators market. To understand the key segments in terms of their growth and performance in the global external fixators market, PMR has developed a market attractiveness index. The resulting index will help providers to identify the existing market opportunities. The orthopaedic trauma devices, such as external fixators, are primarily designed to treat bone fractures and orthopaedic disorders. External fixators reduce the treatment time and require less surgical intervention. In the recent years, computer-aided external fixators are majorly used for fracture fixation and deformity correction. Computer-aided external fixators can work with or without computer-aided solution software. The computer-aided external fixator is a six-axis external fixator with multi-planer corrections, improved accuracy, and decreased complications. In external fixation, pins are usually inserted through the skin into the bone and held in a place by an external frame. External fixators are majorly used in superficial bones (e.g., the tibial shaft). External fixators are available in various forms such as unilateral fixators, circular fixators, and hybrid fixators. These different types of external fixators are majorly used to treat applications such as orthopaedic deformities, fracture fixation, infected fracture or non-unions, and limb correction. The report classifies the global external fixators market by product type, end-user, and regions. The report provides market size and forecast for external fixators inclusive of both types of external fixators. The report analyses the demand for external fixators form hospitals, orthopaedic and trauma centres and the other end-users. In terms of revenue, the global external fixators market is projected to expand at 8.5% CAGR over the forecast period of 2018–2028. The external fixators market is expected to be valued at US$ 3,126.5 Mn by 2028 end. 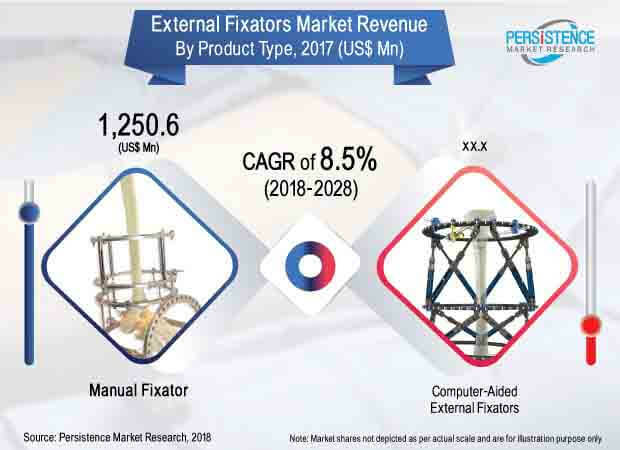 The introduction of technologically advanced and new innovative external fixators are expected to boost the growth of the global external fixators market over the forecast period. By country, the U.S. is expected to dominate the North America external fixators market with a lucrative growth over the forecast period. Increasing number of road accidents and sports-related injuries is the prime factor expected to drive the growth of the external fixators market over the forecast period. Besides, the increasing demand for technologically advanced computer-aided external fixators for better treatment is also projected to drive the growth of the external fixators market over the forecast period. Likewise, favourable reimbursement policies for treatment with computer-aided external fixator in developing countries is the other factor expected to boost the growth of the global external fixators market over the forecast period. In addition, growing adoption and demand for external fixators, coupled with socio-economic factors such as increasing orthopaedic disorders are driving the growth of the external fixators market globally. Public–private partnerships to provide low-cost external fixators in lower-middle-income countries is also expected to propel the growth of the external fixators market. However, availability of alternative treatment options, lack of skilled orthopaedic surgeons and increasing risk of surgical-site infection in orthopaedic deformity surgeries are factors expected to restrain the growth of the external fixators market over the forecast period. It is estimated that surgical site infections account for over US$ 3 billion in the healthcare costs per year, with more than 150,000 new cases occurring annually in the U.S. The risk of developing surgical site infections varies greatly, with orthopaedic trauma demonstrating higher rate of surgical site infections than many other surgical specialties. Geographically, the global external fixators market is segmented into eight major regions viz. North America, Latin America, Western Europe, Eastern Europe, APECJ (Asia-Pacific excluding China and Japan), China, Japan and the Middle East & Africa (MEA). In terms of value, North America was the dominant regional market for external fixators in 2017 and is expected to grow at a high CAGR of 6.5% over the forecast period of 2018–2028. Asia Pacific is expected to contribute significant revenue share in the global external fixators market over the forecast period. However, Western Europe is expected to witness gradual growth in the global market for external fixators. Examples of some of the key players identified in the global external fixators market are Johnson & Johnson Services, Inc. (DePuy Synthes Inc.), Stryker Corporation, Zimmer Biomet Holdings, Inc., Smith & Nephew plc, Orthofix International N.V., Ortho-SUV Ltd., Response Ortho LLC, and Tasar?mmed T?bbi Mamüller San. Tic. Ltd. ?ti, among others. Manufacturers are focusing on research and development activities to develop technologically advanced external fixators. Ortho-SUV Ltd. has collaborated with S. H. Pitkar Orthotools Pvt Ltd for the innovation of computer-assisted new generation external fixation device – Ortho-SUV Frame. Through this collaboration, both the companies have increased their presence in the global external fixators market.